(UPTOWN CHARLOTTE, NC) -- Drawing 8,980 fans per game over 69 home dates in 2018, the Charlotte Knights led all of Minor League Baseball in average attendance per game for the fourth time in five seasons at BB&T Ballpark. The Knights once again packed the ballpark consistently in 2018, hosting 23 sell-out crowds over the course of the regular season. 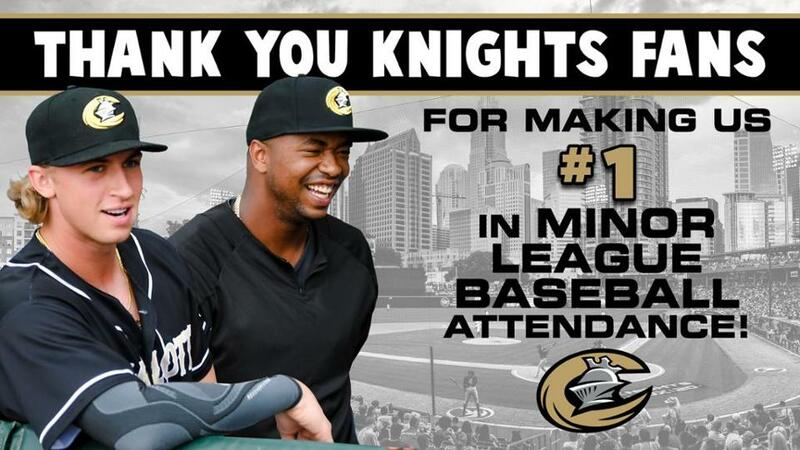 In all, the Knights welcomed a Minor League Baseball-best 619,639 fans through the gates in 2018 at BB&T Ballpark. Since opening BB&T Ballpark on April 11, 2014, a total of 3,233,451 fans have attended 350 Knights' home games. The most-visited venue in all of Minor League Baseball since 2014 has welcomed 133 sell-out crowds over the course of that span. The team has averaged 9,238 fans per game over five seasons. "We are very pleased with the 2018 season at BB&T Ballpark," stated Charlotte Knights Chief Operating Officer Dan Rajkowski. "Our fifth season in Uptown Charlotte brought in over 600,000 fans and the ballpark continued to serve as an elite summer destination venue in Uptown Charlotte. These five years in Uptown Charlotte have exceeded our expectations and we couldn't have done this without the support of our fans and our partners of Mecklenburg County and the City of Charlotte. We're looking forward to another great season in 2019." The 2019 home opener at BB&T Ballpark in Uptown Charlotte is on tap for Thursday, April 4 at 7:04 p.m. against the Durham Bulls, the team's sixth season in Uptown Charlotte. Season memberships for 2019 are on sale now and can be purchased by calling 704-274-8282.